Even after 10 years left cooling in a pool outside of a reactor core, a single spent nuclear fuel assembly still emits 20 times the lethal dose of radiation, according to the NRC, the federal agency tasked with oversight of such facilities. There are more than 1,800 such assemblies in so-called “dry storage” at Cooper; the Calhoun plant north of Omaha has about 300, with nearly 950 more due to be moved out of the pool there in about three years, if things go according to plan. Read the entire news story here. 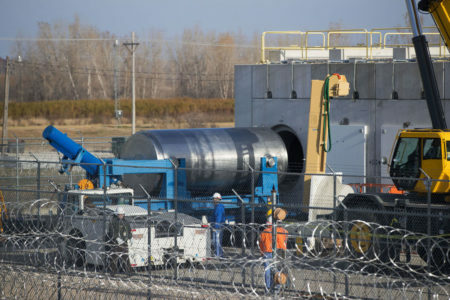 This entry was posted in Nebraska / Midwest News and tagged Cole Epley, Nebraska's nuclear waste storage, NPPD's Cooper Nuclear Power Plant, nuclear waste storage, Omaha World Herald, OPPD's Ft. Calhoun Nuclear Power Plant on November 29, 2017 by Helen Deffenbacher.